Simon Morris was a talented centre who with his considerable pace was equally at home on the wing. He played 104 games for Gloucester between 1990 and 1997. It would have been many more but for a cruciate ligament injury which at the age of 25 put paid to a full time professional career at the highest level. He played 6 games for the South West division, and came close to an England cap. Simon Morris was born in Gloucester on 3 May 1969 into a sporting family. His father Winston, who was a policeman stationed in Gloucester, was from the Forest of Dean and played centre for Lydney. He holds the record of 571 appearances for Lydney and captained the club. His mother played hockey for Chepstow Ladies. His uncle, John Morris, played 490 games for Lydney, is the club’s record points scorer and captained the club for 11 years. Scrum half John Morris played for Western Counties in their 9-0 victory over the Wallabies at Bristol in 1967 and in the 3-3 draw with the Springboks at Bristol in 1969. He also played for Gloucestershire in the 1970 County Championship final at Kingsholm and had a spell playing for Newport. When Simon was 4, his father was stationed at Lydbrook in the Forest of Dean. Simon’s primary education was at Lydbrook before going on to WhitecrossComprehensiveSchool. He grew up with the Lydney club, playing mini-rugby from the age of 8 and standing on the touchline watching his father in the afternoon. He made his first team debut for Lydney at 17 and after a few first team games made his Kingsholm debut playing centre against Gloucester on Boxing Day 1986. Gloucester won the match 25-9. A keen footballer, he was also playing football for Cinderford Under 18s at this stage in his career. Simon admits that it was the social side of rugby that finally clinched it! At the start of the 1990-91 season following the many successes and ultimately the bitter disappointment of finishing cup and league runners-up the previous year, a great Gloucester side was breaking up. With the impending retirement of Richard Mogg, the club showed an interest in the talented young Lydney three quarter and after 4 successful seasons with the Forest club Simon was persuaded to try his luck at Kingsholm. His preferred position was centre, where he felt more involved in the game, but with his pace it was always tempting to play him on the wing. His first team debut was at Kingsholm on 29 September 1990 against Ebbw Vale. He scored a try; one of seven in a 45-3 win. It was the first of many big games for Simon Morris. He was affected more than most by the match day adrenalin rush and the buzz of playing in front of the Shed. Throughout his career he never ate after 10 o’clock on the morning of a game. He played 15 first team games in that first season scoring 7 tries, and made an immediate impression. In September 1991, Gloucester played against near full-strength England and Ireland XVs at Kingholm. The matches, which were staged as part of the Kingholm Centenary celebrations, also served as warm-up games for the 1991 World Cup. Morris played in both games, scoring a try in Gloucester’s 14-13 win against the Irish. He tells the story of how in the bar afterwards his sergeant and his mates in the police force were all congratulating him. The Guinness was flowing…. It was then that he discovered that they had all got the night off to watch him play. Simon had to stay sober and go back on shift at 10 o’clock because he was late asking and so many others had got in before him! Perhaps on the strength of his performances in these games, Simon Morris was chosen to play on the wing for South West Division. He made his debut for the South West in an 8-0 defeat by London Counties at Imber Court on 5 October 91 alongside Neil Matthews, John Hawker and Paul Ashmead. He broke his sternum and was out for six weeks preventing him from playing in the rest of the tournament. He finished the season as leading Gloucester try scorer in 1991-92 with 13 tries including a hat trick against Newport in January. 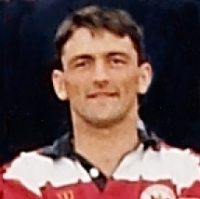 Simon was the only Gloucester player in the victorious South West team of 1992 – the first time that the South West Division had won the Divisional Championship. He started the campaign with another hat trick on the wing in the 29-9 victory over the North at Kirkstall. TheTimes said “If form in the divisional championship carried more weight, Nick Beal and Simon Morris might be challenging the likes of Ian Hunter and Rory Underwood more strongly for England wing places against France next month.” The 26-24 win over London at Kingsholm the following week had everyone on the edge of their seats. The Times described it as “one of the best contests in the history of the championship.” The 18-18 draw at Leicester which secured the title was a desperate affair in which the Midlands pack dominated and could have won with a pushover try at the death but opted for a penalty instead. At the end of this season Simon Morris was close to an England cap. Simon had followed his father into the police force and when the game turned professional in 1995-96, a number of rugby-playing policemen were given the opportunity of taking a five year sabbatical to play full-time professional rugby. After missing the whole of that inaugural season, Simon Morris missed this opportunity and had to decide whether to leave the police force and accept a full time professional contract, risking a career-ending further injury to his knee, or to step down and play as a part-time professional, while remaining in the force. He played one final first team game for Gloucester on 14 March 1997 against Bedford, where a very weak team lost 19-58. As a test of his fitness it was not too successful as he had to go off early in the second half with a tweaked hamstring. At the end of the season he opted to play part time with Worcester joining Tim Smith, Paul Holford, Bruce Fenley and Chris Raymond. After two seasons there was an influx of new signings at Worcester, who were now pushing towards the premiership. This, combined with recurring hip and hamstring problems which were limiting his availability, prompted a further move to Cinderford where he continued to play on a part time contract. Simon retired in 2001, limiting his rugby to games for Veterans XVs and the Police. In 2006, he had a hip replacement, but continues to turn out for Veterans games.